Often times, passengers on snowmobiles are victims in snowmobile accidents resulting from the drivers’ negligence. Snowmobiles are a popular winter sport, especially in Michigan where we get a lot of snow. According to research, modern snowmobiles can weigh in excess of 600 pounds and travel at speeds exceeding 90 miles per hour. According to research, children younger than 16 years of age are often times passengers that are injured or killed when they fell from their snowmobiles, had the vehicle roll over them, or the driver crashed the snowmobile into another snowmobile, vehicle or stationary object. In addition, intoxication is a major cause in many accidents. Another common cause are dangers on the snowmobile trails by property owners, such as chain link fences that stretch across the trail and cause serious injuries to the driver and their passenger. Our top rated Buckfire & Buckfire, P.C. personal injury attorneys have significant experience in representing passengers injured in a Michigan snowmobile accidents. Passenger victims do have legal rights and if the driver of the snowmobile is found negligent may have a possible personal injury claim against the driver for injuries suffered. In fact, drivers who cause accidents can be held accountable for money damages if they are negligent in the operation of their snowmobile or intoxicated at the time. Property owners can also be held responsible if they are aware that snowmobile riders use their property and they have known dangers on the property. 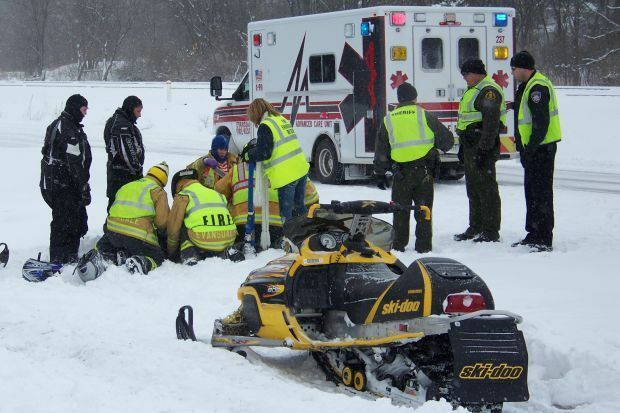 It is very important that passenger injury victims contact an experienced Michigan snowmobile accident attorney immediately after the accident to discuss their rights. If you would like more information about your legal rights after a Michigan snowmobile accident injury, you can order our FREE book, "The Ultimate Guide To Injury Cases in Michigan" by Lawrence J. Buckfire. The book serves as a guide to victims of Michigan personal injury accidents on their legal rights. It also includes the biggest mistakes that can ruin your injury case. Our book sells for $14.95 on Amazon but Lawrence will send it to you for FREE. Our attorneys will represent you in your Michigan snowmobile injury case under our NO FEE PROMISE. This means that you will not be charged any legal fees whatsoever unless we obtain a settlement or recovery for you. You have absolutely no obligation for legal fees unless we win your case. If we do not obtain a settlement for you, you owe us nothing! For more information about injuries suffered while riding as a passenger on a snowmobile in Michigan, call our office immediately at (800) 606-1717 to speak with one of our award winning Michigan snowmobile accident injury attorneys. We will investigate your case and collect all evidence and witness statements to prove and win your case. Many times, the wrongdoers will deny fault and blame the victim. When contacted, our office can immediately locate witnesses, obtain evidence, and take other measures to prove your case. Call today for your free consultation!